This episode provides the kind of awesomeness that is only possible in season two. 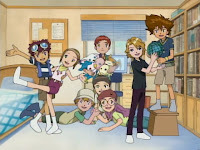 The digidestined plan a full assault on the Digimon Emperor, with the trickiest detail being the cover story for it. Tai, Matt and Izzy handle that end, but run into a few amusing complications of their own. Furthermore, it's a definitive character episode for Yolei as she solves her problem of thinking too much by not thinking at all. The good news is that they're going on the offensive, foregoing their previous strategy of toppling spires as they arise in order to hunt down the Emperor's base and take him out directly. The bad news is that the base is well guarded by several rabid beasts that would just as soon gnaw on each other than lose their bloodlust. Pretty violent stuff actually. When they spot the base, Cody and Izzy barely escape alive. Realizing that the assault would be fraught with peril and could take longer than a few hours depending on the inevitable complications, Tai concocts a plan where he, Matt and Izzy go camping and say the new kids are going too. That way, the team is free to spend a few days in the Digital World and their parents won't ask questions about why they're packing for a week in the wilderness. Davis, however, makes the mistake of sarcastically inviting Jun. Nobody in their right mind would interpret him as being serious. Jun, however, shows up at the meeting point wondering where Davis is. Matt has to fend her off, duping her into closing her eyes while they take off. He earns a scolding from chaperone Hiroaki Ishida, who knows everything there is to know about women. Just ask his ex-wife. Yolei's extreme attitude is almost as funny. She's pumped about this mission, kicking the air, marching forward, climbing control spires and jumping off mountains. It damn near gets her and poor Hawkmon killed when a Dokugumon shows up as they're climbing down a pit. Hawkmon takes a poison attack full-on and Yolei's adrenaline rush wears off in a hurry. I call this the definitive character episode for Yolei because while her actions are extreme, they are justified in such a way as to emphasize other traits that are just as significant. It's also probably the episode where viewers can decide with confidence where they stand with her. Davis is all over the map all season and Cody's role is incomplete without his involvement in certain plot elements down the road. With Yolei, this is pretty much what you're getting. It's easy to dislike episodes where a character suddenly becomes a jerk and this one probably belongs in that category. Regardless, I enjoyed it for two reasons. One is that Goddamn Action Hero Yolei is so much fun. Makes you want to take a page from the episode title and sync her antics to German techno. Secondly, the explanation for it is absolutely brilliant. 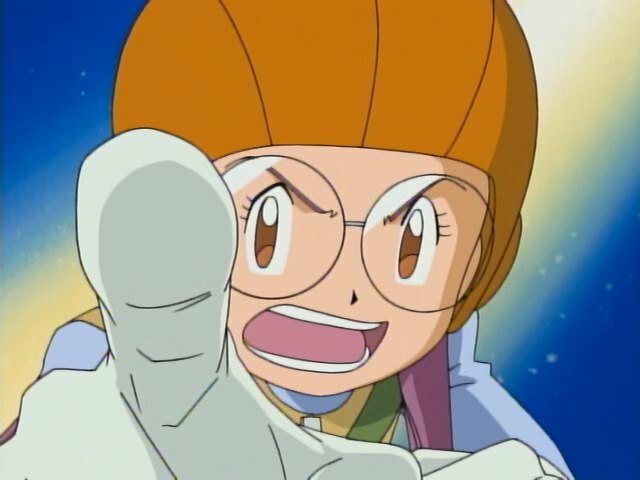 We've just come off an episode that is all about the heroics of the original group, punctuated by a direct confrontation with Wizardmon's ultimate sacrifice. Yolei was worried then about holding their torch, and now she's expected to help lead an assault on a heavily guarded base. Losing sleep fretting over the mission, she forces herself to get psyched up, putting herself in a mindset that goes from no confidence to over-confidence. 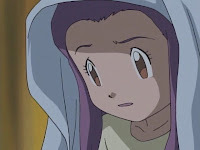 Throughout the season, she has problems with thinking the wrong way, which she recognizes and is usually able to change. Sometimes, however, that change is just as bad. Finally, let's give some credit to Hawkmon. Yolei drove him absolutely bananas this episode, but once it's over he was able to shrug and recognize that it's just part of the package. We should do the same. Good God, is anybody ever going to beat Kuwagamon? He's shown up repeatedly over these two seasons and the digidestined are something like zero for four against it. The whole group does their best to look occupied when Izzy's mom drops in, but they take it to this ridiculous level. TK and Yolei are arm wrestling (with Cody as a referee), Izzy's holding a bunch of stuffed animals, Tai and Matt are apparently playing with a globe, and Davis and Kari are dancing without any music playing. If I was the mother of a socially reserved computer geek, I'd be awfully suspicious of this all happening at once in his room. Plus Davis is totally feeling up Kari. Watch that hand, buddy, her brother's in the room. Maybe that's why she's stepping on his foot. TK hints at a story about Hiroaki Ishida being chased by a grizzly bear. I'm going to assume that's a mistake and that Hiroaki was actually chasing it. There's a quick running gag where Matt tells TK he has a lot to learn about women, with Hiroaki telling Matt the same thing later. The Hiroaki moment is cute, but I couldn't figure out what exactly TK said to Yolei that Matt took as unfriendly to women. When the base vanished from its original location, Yolei got all up in Tentomon's grill about losing it. She had completely lost it by this point, which was the intention of the scene, but seriously... Tentomon volunteered to watch the base and the damn thing up and flew away under his nose. Poor effort from him. 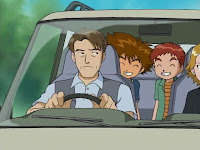 It takes a while to get going, but I think the last four episodes of the Digimon Emperor arc are fantastic. Despite the dodgy whirlpool art in episode 19.